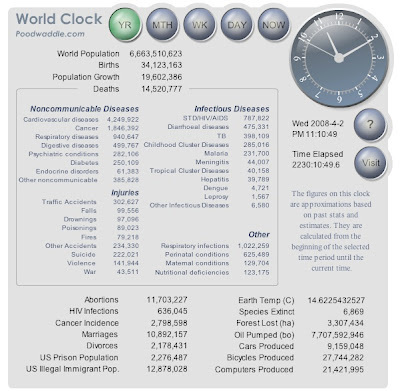 Just linked to a really interesting site called World Clock, (via an RSS feed from Xigi.net) created by Poodwaddle, an outfit that creates some very cool apps to plug into your website. World Clock shows the current status of earth in real time. In some ways, the information displayed indicates why no truly advanced species should give us a close encounter of the third kind experience until we learn how to be better stewards of the planet. As an aside, Time keeps on Ticking... comes from a classic from Steve Miller called Fly Like An Eagle.